Joe Greenstein (64 inches, 140 lbs. 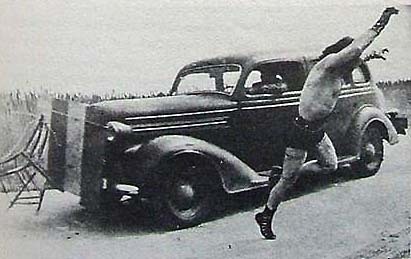 ), of the Bronx, New York, was a sideshow and carnival strongman known as "The Mighty Atom." 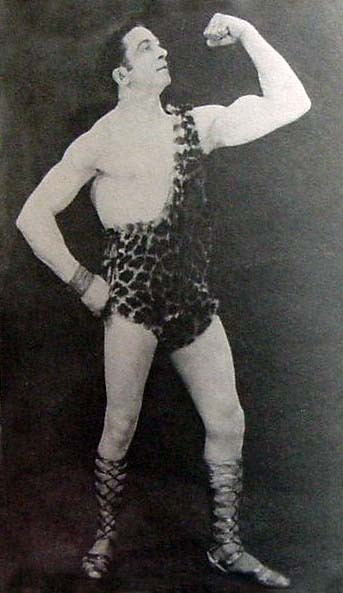 He also appeared in vaudeville, both in Europe and the United States, over a period of about 20 years. 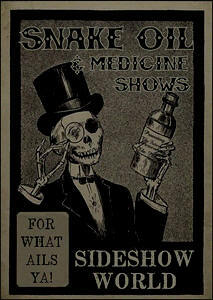 He was still able to perform many of his feats when past 80 years of age. He could 'break' by chest expansion as many as three chains placed together, of a size designated as No. 8 or No. 10 jack chain. This consisted of S-shaped links of the type that could be parted rather than broken. 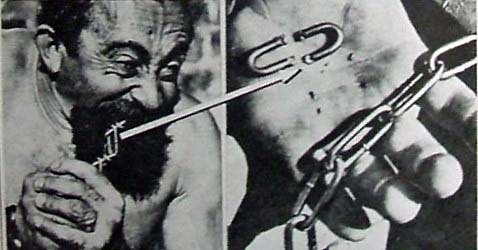 Greenstein could also bend an iron bar or a horseshoe with his teeth while one end of the bar was fixed (as in a vise.) The bar that he used for this purpose was usually one of 1/2 inch mild cold-rolled steel, 8 or 9 inches long. This size of bar he could also bend into a U shape with his hands. But Greenstein's most extraordinary and spectacular feat far transcended these chain breaking and bar-bending exhibitions. He could bite a nail in half! That he actually possessed the ability to do this he demonstrated on many different occasions. On one of these, about 1934, when he was 53 years of age, Greenstein walked into the well frequented New York gymnasium operated by Siegmund Klein and before the incredulous stares of Klein and about a dozen of his pupils who were working-out in the gym at the time, proceeded to bite in two a 20 penny nail that Klein, after satisfying himself that it was a strong and sound one-supplied. Klein's description of the act was as follows: 'Greenstein placed the nail in his mouth, clamping it between his molars and holding onto the head of the nail with his fingers. Then with tremendous pressure he bit into the nail, and one could hear the teeth crunching as though they were being ground. He then turned the nail a little and bit again. On the last bite he just bent the nail slightly-and presto, it was in half! . . . all of us checked his teeth to see that there were no special mouth pieces or caps over his teeth.' Greenstein was capable also of performing with a 25-cent coin the same feat of biting and breaking." During World War II, Mr. Greenstein unselfishly gave his time to Uncle Sam's Bond Drive. This modern day Samson did not only lecture but demonstrated the strength of his hair by pulling a truck loaded with passengers, and in this way he sold hundreds of thousands of dollars worth of bonds for Uncle Sam. 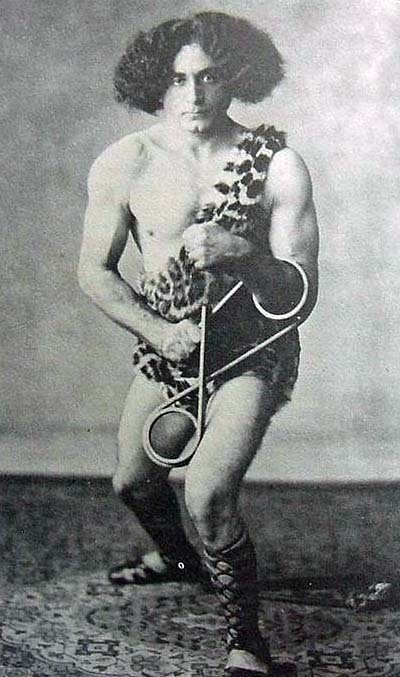 It is a fact that this modern Samson's hair was so strong it could not be pulled out. One of the most astounding feats of strength ever seen was headlined by the Buffalo (New York) Evening Times on September 29th, 1928: "Mighty Atom -- Super Strong Man Pits Brawn Against Plane, Wins." At the Buffalo Airport before a large crowd of stunned witnesses, this human dynamo held his ground when the pilot increased the plane speed from 800 rpm for an approximate speed of 30 miles per hour to a speed of 1,600 rpm for a speed of 60 miles per hour. Without a doubt, the Atom was the strongest haired man in the world. "Believe It or Not" by Ripley had featured this superman many times over the years.